Knowledge of Russian gives you direct access to a fascinating cultural and historical tradition and brings you closer to one of the world's most dynamic geopolitical regions. This degree cultivates a high proficiency in Russian language and develops your skills in analysis, presentation, problem-solving and intercultural understanding. English Language and a foreign language (other than Ancient Greek, Biblical Hebrew or Latin) at grade B or 6, plus Mathematics at grade C or 5. A score of 16 points in three higher level subjects, with no score lower than 5. A score of 15 points in three higher level subjects, with no score lower than 5. BTEC Level 3 Extended Diploma (QCF) or BTEC Level 3 National Extended Diploma (RQF - teaching from 2016) with Distinction, Distinction, Distinction. Pass in Access to HE Diploma with a minimum of 28 credits awarded with Merit in the Level 3 units. Successful completion of the WBQ Advanced Skills Challenge Certificate plus 2 GCE A-Levels at grades ABB. In addition to A level and International Baccalaureate, UCL considers a wide range of international qualifications for entry to its undergraduate degree programmes. UCL Undergraduate Preparatory Certificates (UPCs) are intensive one-year foundation courses for international students of high academic potential who are aiming to gain access to undergraduate degree programmes at UCL and other top UK universities. Typical UPC students will be high achievers in a 12-year school system which does not meet the standard required for direct entry to UCL. For more information see: www.ucl.ac.uk/upc. If your education has not been conducted in the English language, you will be expected to demonstrate evidence of an adequate level of English proficiency. Information about the evidence required, acceptable qualifications and test providers can be found on our English language requirements page. A variety of English language programmes are offered at the UCL Centre for Languages & International Education. The programme is highly compatible with students with little or no previous knowledge of Russian (Mode One), and also for students with Russian A level or equivalent (Mode Two). You will have the opportunity to learn from academics who are experts in language, literature, film, history, economics, and politics. There is a large range of cultural options to choose from. You will spend your third year studying in Russia. If you are starting this degree programme with no prior knowledge of Russian, your first year will also involve a month in Russia. 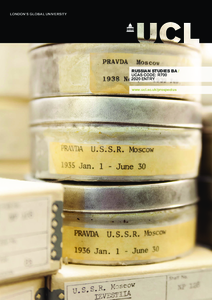 UCL SSEES is the largest national centre in the UK for the study of Central, Eastern and South-East Europe and Russia. The SSEES Library contains over 400,000 books, journals and film resources. In each year of your degree you will take a number of individual modules, normally valued at 15 or 30 credits, adding up to a total of 120 credits for the year. Modules are assessed in the academic year in which they are taken. The balance of compulsory and optional modules varies from programme to programme and year to year. A 30-credit module is considered equivalent to 15 credits in the European Credit Transfer System (ECTS). You do not have to indicate your choice of track on application to the programme. Your third year is spent in Russia. The department can offer a choice of options not only in Moscow and St Petersburg but also in other cities. Immersing yourself in the language and culture of Russia will significantly improve your language fluency and the depth of your understanding. An indicative guide to the structure of this programme, year by year. Mode One students will take Comprehension of Russian (Year 1A) and Use of Russian (Year 1A) to the value of 1.0 credit. Mode Two students will take Comprehension of Russian (Year 1) and Use of Russian (Year 1) to the value of 1.0 credit. You will select modules from a wide range of options, in accordance with the study track you have chosen. All students (irrespective of mode) will select modules to the value of 2.5 credits. See full details of modules for this programme. Mode One students will take Comprehension of Russian (Year 2A), Use of Russian (Year 2A) to the value of 1.0 credit. Mode Two students will take Comprehension of Russian (Year 2) and Use of Russian (Year 2) to the value of 1.0 credits. All students (irrespective of mode) will select modules to the value of 2.5 credits, except for students on the Literature and Culture track, who will select optional modules to the value of 2.0 credits. You will spend your third year abroad in Russia. You will select 3.0 credits from a wide range of options, in accordance with the study track you have chosen. You will follow an integrated language programme including classes in written and spoken Russian. In both language and content courses, we offer lively and varied teaching methods including lectures, seminars and small classes in which the focus is on active student participation. You will be assessed by written, oral and aural examinations, presentations, coursework essays, and a dissertation. Some elements of assessment throughout the programme count towards your final degree while others are used to monitor your progress and provide you with advice on how to improve. Graduates will be equipped with Russian language skills and an understanding of the political, economic and cultural factors involved in Russian society. These attributes are sought after by governmental and non-governmental organisations, consultancies, as well as commercial, finance and media organisations (particularly those with cross-border practices or activities). Leading figures from government and business regularly stress the need for well-qualified Russianists. Our students are capable of taking on employment in a variety of fields where use of Russian is key. A degree with Russian can lead to a career in journalism, in the civil service, as well as in cross-border businesses and financial organisations. UCL is commited to helping you get the best start after graduation. Read more about how UCL Careers and UCL Innovation and Enterprise can help you find employment or learn about entrepreneurship. The fees indicated are for undergraduate entry in the 2019/20 academic year. The UK/EU fees shown are for the first year of the programme at UCL only. Fees for future years may be subject to an inflationary increase. The Overseas fees shown are the fees that will be charged to 2019/20 entrants for each year of study on the programme, unless otherwise indicated below. Full details of UCL's tuition fees, tuition fee policy and potential increases to fees can be found on the UCL Students website. Various funding options are available, including student loans, scholarships and bursaries. UK students whose household income falls below a certain level may also be eligible for a non-repayable bursary or for certain scholarships. Please see the Fees and funding pages for more details. If you are concerned by potential additional costs for books, equipment, etc. on this programme, please get in touch with the relevant departmental contact (details given on this page). Funding opportunities relevant to the department may appear in this section when they are available. Please check carefully or confirm with the programme contact to ensure they apply to this degree programme. The Scholarships and Funding website lists scholarships and funding schemes available to UCL students. These may be open to all students, or restricted to specific nationalities, regions or academic department. In addition to meeting the academic criteria, you are likely to enjoy and be successful at studying Russian if you have an interest in and aptitude for studying languages, a sustained interest in literary, historical and cultural studies, and are keen to take advantage of the social and linguistic opportunities on offer while living in Russia as part of your degree. Application for admission should be made through UCAS (the Universities and Colleges Admissions Service). Applicants currently at school or college will be provided with advice on the process; however, applicants who have left school or who are based outside the United Kingdom may obtain information directly from UCAS. We will assess your application and then decide whether to make you an offer. If you are offered a place on the programme and live in the UK, you will be invited to an applicant open day. The applicant open day will include talks from staff about the programme, available language options, and student life at SSEES. You will have the opportunity to ask questions, and will take a tour of UCL led by current students. For further information on UCL's selection process see: Selection of students. UCL attends various events in the UK and overseas to help you make an informed choice about pursuing further study. We guarantee all first-year students a residential place. Find the right accommodation for you. Information provided by the Higher Education Funding Council for England (HEFCE).